(ISJM) According to news reports gravestones were vandalized at the Jewish cemetery of Ioannina in northern Greece last Monday night (January 19). "Three tombs were desecrated and damaged Monday evening in the cemetery," said President of the Central Jewish Council of Greece (KIS) Moisis Constantinis. Constantinis and KIS accused the police of failing to heed calls for increased security at the cemetery, which has been vandalized three times before in recent years (There is a certain irony here, since ISJM has recently received reports that KIS is considering selling some neglected cemeteries elsewhere in the country - reports that need to be confirmed). In general the Jewish cemeteries in Greece are in poor condition, and many have been totally abandoned. The Ioannina cemetery (of which parts were photographed for ISJM by Vincent Giordano) is one of the best preserved in the country. KIS also reported that anti-Semitic inscriptions were found on tombs in a Jewish cemetery in Athens earlier this month and on a Jewish monument in Corfu four days after the Gaza conflict began. A large segment of the Greek population has long offered large and vocal support for the Palestinian cause. During periods of greatest armed conflict between Israel and Palestinians Jewish sites in Greece have often been targets for expressing anti-Israel (and anti-Jewish) sentiments. During the Gaza War several sites in Europe have been the targets of anti-Israel and anti-Semiitc vandalism. These include the historic synagogues in Pisa, Italy and Maribor, Slovenia. Ruth Ellen Gruber reports that there was a conference this weekend about Jewish history in Alghero, a small town on the northwest coast of Sardinia where Jews settled in the mid-14th century. One of the principal speakers was Mauro Milanese, an archeologist who has directed excavations in Alghero's old Jewish quarter. Click here for Ruth's blog. Ruth Ellen Gruber writes about the restoration of the synagogue in Bielle (Piedmont), Italy. The gem-like synagogue in Biella, near Torino and Vercelli in the Piedmont region of northwest Italy, has been rededicated after "important and decisive" restoration. Dating from the early 17th century, the synagogue, at vicolo del Bellone 3, occupies the top floor of a medieval house in the heart of what was the historic Jewish quarter. The sanctuary is small and rectangular in shape, focused on a splendid 17th-century Ark and an oval, waist-high carved wooden enclosure around the Bimah. The €350,000 restoration, overseen by the Jewish community in Vercelli and funded in part by the Piedmont Region and a local bank, included structural consolidation and repair of the roof, which threatened collapse, as well as restoration of the elaborate Ark, the women's gallery and other interior fittings. Further restoration work is planned. The Biella synagogue is one of about 16 beautiful synagogues in Piedmont, many of which have been restored in recent years and can be visited. You can find some information on the Jewish Community of Torino web site. On a related note, Yeshiva University Museum has recently published a new volume about the Jews of Piedmont, inclduing a brief essay of mine about the synagogues. Spain: Inauguration of Exhibition "Lorca, Lights of Sepharad"
(ISJM) Next week, the government of the Spanish Region of Murcia will open a new exhibition about the medieval synagogue and Jewish quarter of Lorca. The exhibition presents and interprets the archaeological evidence and material finds of excavation that began in 2003 in the precinct of Lorca’s 15th-century castle. Archaeologists, led by Ana Pujante Martínez and Juan Gallardo, uncovered the remains a synagogue and of houses of the surrounding Jewish quarter. Remains of the synagogue and one of the houses are being conserved to be incorporated into a museum. The Jewish quarter, the synagogue and the many identifiably Jewish objects found in their rubble constitute one of the most important Jewish archaeological finds in recent decades. Plans are being discussed to have the exhibition travel abroad after 2010. The synagogue consisted of a main prayer hall 134 square meters in size with built in benches around the perimeter, large enough to accommodate 70 worshipers. An Aron ha-Kodesh was situated on the east wall, and foundations to support a bimah were found in the center of the room. 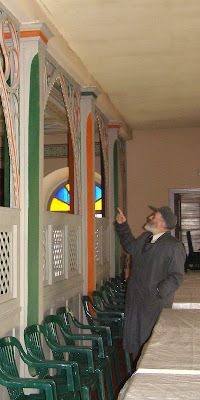 The prayer hall was preceded by an open courtyard, which led to a small vestibule with a place for washing. Above this was a small gallery of 8 square meters – presumably for women - which had collapsed into the vestibule area. The small space makes one wonder, however, whether women may have been accommodated elsewhere in the hall, perhaps separated by a temporary divider – now gone. The museum of the synagogue will be part of the future luxury Parador hotel which will open in the castle, situated up the hill from the former Jewish quarter The remains of the synagogue and surrounding buildings were found when construction began on the luxury hotel which will be situated in the castle. Published plans call for the synagogue to be protected by a structure 43 meters long and 27 wide, with a total area of over one thousand square meters and a height ranging between five and 2'10 meters. This protective cover will keep a constant temperature to prevent thermal changes affecting the archaeological remains. I will be visiting the site next week in conjunction with the exhibition opening and will learn more about its future. In 2006, some of the glass finds from the Jewish quarter and synagogue excavations were presented at the conference "The glass of the Middle Ages and Andalusí" held at the Royal Factory Crystals of La Granja. The synagogue lamps dating from the 15th century have been restored for the new exhibition. These glass lamps are considered among the most important recent archaeological finds in Spain. At least 15 lamps have been reconstructed using nearly 3,000 shards of glass uncovered in the excavation. These lamps are a tangible link to the appearance of medieval synagogues previously known Conservation work was funded by the Patrimonio Histórico de la Dirección General de Cultura y del Museo Arqueológico Municipal (Heritage Service of the Directorate General for Culture and the Municipal Archaeological Museum). In honor of the Detroit Auto Show now on in Detroit, I've written a piece about architect Albert Kahn for The Forward. There are pictures in the print edition. Albert Kahn is America’s forgotten architect — even though in his lifetime, he (and his firm) produced more buildings than any other architect, and his design and production method changed the face of the country. Eighty years before the bailout of the auto industry, just before the Great Depression, Kahn built the most opulent of Detroit’s new corporate skyscrapers — the Art Deco-style Fisher Building. Facing the GM headquarters, Kahn’s grandest expression of civic architecture defined the unique American union of commercial and civic identity. (ISJM) A report on the current state of Poland’s Jewish cemeteries published last October has revealed that dozens still lie unmarked and neglected while many others have been built over completely. Commissioned by the Lo Tishkach Foundation, the report Jewish Cemeteries of Poland: Masovian Region, focuses on the 126 Jewish burial grounds of the Masovian Voivodeship, Poland’s largest region. For me, reading the report is mostly distressing, since it indicates that there has been a change for the better for only a small number of cemeteries sites since I published (with Phyllis Myers, Lena Bergman and Jan Jagielski) the first comprehensive survey of Polish Jewish cemeteries in 1994 (updated and revised in 1995). It is important that that survey, undertaken in partnership between the US Commission for the Preservation of America's Heritage Abroad and the World Monuments Fund, be up dated for all of Poland. In the Masovian Region - which as the result of administrative reorganization comprises several of the districts listed in the US Commission survey report - 126 cemeteries listed in the new survey, only 20 (15.9%) of which are deemed protected - that is identified, delineated and maintained. All the other sites remain in some manner at risk. Still, there are some successes, and these frequently involve local non-Jewish communities. To read summaries of some local cemetery preservation projects in Poland click here. For more on Lo Tishkach see my earlier blog post: Lo Tishkach Works to List All European Jewish Cemeteries. Tomek Wisniewski, the indefatigable chronicler of Jewish sites in the Bialystok Region and author of several guides to Jewish history and monuments in the area has recently adapted to video. He sent one his most recent projects...a short film highlighting the wonderful architecture of the great synagogue of Orla, and the terrible neglect the synagogue has suffered for decades. On-again off-again restoration projects have preserved the building, but it has been shuttered and almost forgotten. Tomek records a recent event that opened the building and brought flocks of local residents to see its grand interior for the first time in years. I first visited Orla in 1990 when the building was still covered scaffolding. A photo from this trip was the "teaser" for the exhibition "The Future of Jewish Monuments" that traveled the USA beginning in 1990 (photo). Sadly, while many of the other building pictured in the exhibition have subsequently been restored, Orla has been "forgotten." As Tomak makes clear, it is time to remedy that situation. Here are some of my photos of the synagogue. The striking synagogue, with a distinctive scalloped facade, was originally built in the 17th century. Its sanctuary has nine bays and a vaulted ceiling, and there are still some traces of marvelous painted decoration -- vines, garlands, floral motifs, and animals. The building dominates the little town, where before the Holocaust Jews made up nearly 80 percent of the local population. The synagogue was listed as a cultural heritage monument before World War II. Tomek reports that when it was all but destroyed in a huge fire in 1938, the Polish government stepped into to reconstruct and restore the building. The synagogue was reconsecrated in 1939, but then the Nazis used it as a field hospital and later turned it into a warehouse for chemical fertilizer. For decades it has stood empty and in ever-deteriorating condition. To read Ruth's full comments click here. In November I mentioned the publication of a lavish new book about Jamiaican Jewish artist Isaac Mendes Belisario. Jewish families who trace their roots back to England, Spain, Portugal and beyond have distinguished themselves for generations as merchants and financiers in the Caribbean. Reminders of the contributions they have made to the varied cultures and societies of the region can be found in the graveyards and in postcolonial, national archives of what are now its many small, independent countries. With this history in mind, Jamaica’s Mill Press has published “Belisario: Sketches of Character.” A large, lavishly illustrated volume that looks like a coffee-table art book, it is, in fact, a sweeping saga of overlapping family histories, a high-drama page-turner complete with a Central American property-sale scam (the offering of an entire, imaginary country, that is) that makes the Bernard Madoff and not-so-long-ago Enron frauds look, in its publisher’s words, “like child’s play.” Part biography and part cultural history, the book sets the stage for a look at the work of the 19th-century, Jewish-Jamaican artist Isaac Mendes Belisario (1794–1849), about whom little hitherto was known. Exquisitely produced by a small publishing company based in Kingston, Jamaica’s capital, it offers a vivid portrait of colonial-era Caribbean Jewry in general, and of merchant-class Jews in Jamaica in particular. Publication: 50 Years Since Piechotka "Wooden Synagogues"
Its been 50 years since the release in English of Wooden Synagogues (Warsaw: Arkady, 1959) by Maria & Kazimierz Piechotka. 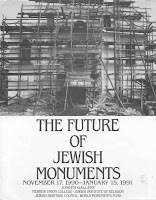 I've just written a short account of some of the influence of the book on American synagogue architecture for Nextbook. The Blueprint: How a 1959 book changed the architecture of American synagogues. Thanks to Paul Rocheleau and Bob Schwartz for use of their photos. This is derived from a longer study (forthcoming) on the influence of Polish synagogues on American synagogue architecture first presented in Poland last October (and dedicated to Maria & Maciej Piechotka). I enjoyed the opportunity of visiting with them and their architect son Michal. The Piechotkas taught me much of what I know of synagogue architecture during several extended visits in New York and Warsaw in the 1990s. Maciej is recovering from a broken hip, suffered at the end of the summer right after a retrospective exhibition of his drawings held in Warsaw, but seemed in good spirits. To my readers: please send me more examples of the influence of Wooden Synagogues. I was happy to receive this week copies of the exhibition catalog Ebrei Peimontesi: The Jews of Piedmont just published by Yeshiva University Museum. Why was I pleased? One reason is because the book has my essay "The Synagogues of Piedmont," that I wrote at the time of exhibition 12 years ago. The museum is to be congratulated on their perseverance to get this book published. It was occasioned by the exhibition of the same name held in 1996, but really the book it can stand alone. It is well designed and produced and benefits from the exquisite photos of synagogues by Alberto Falco. Ebrei Peimontesi: The Jews of Piedmont (New York: Yeshiva University Museum, 2008). [ISBN 0-945447-19-1] Softcover, list price $20.00. Ruth Ellen Gruber has posted a remembrance of Henry Halkowski by musician, author, filmmaker, photographer and mensch Yale Strom. Yale knew Henryk for almost 25 years. Henryk died suddenly of a heart attack on the night of January 1-2. For a picture of Henryk click here. It has been 18 years since I first visited the New Cemetery at Kazimierz Dolny and marveled at the power and beauty of the giant monument which sits on the hillside in front of what remains of the cemetery proper, with its small number of still in situ matzevot. Returning to the site after many years this fall, I was happy and amazed to find the power and pathos of the site undiminished. Despite my having visited scores of Jewish cemeteries in the meantime, and seen dozens of Holocaust monuments (and even helped design a few), this site still resonates strongly with me. The enormous monument - which is a kind of giant vertical lapidarium 25 meters long and 3 meters high and holding 600 fragments of Jewish gravestones - was erected in 1983-85 on the design of Polish architect Tadeusz Augustynek. I will not describe the entire project, as I have done so before, and James Young treats the monument at length in his now classic work The Texture of Memory (New Haven: Yale University Press, 1994), 199 - 203. It is enough to say that Augustynek created a giant matzevah (gravestone), with terrible crack or rift on one side, indicating the break in Jewish life, Jewish history, and the very broken nature of the Jewish cemetery and its gravestones, too. The stones used in the monument were all excavated from pavements laid during the German occupation40 years earlier. It is said that Polish workmen defied orders and placed the stones face down to protect their inscriptions. Certainly when they were dug up, the inscriptions and carved reliefs of Jewish symbols remained very clear, and some stones even retained traces of color from the original polychrome painting on the limestone. On this recent visit, I was able to take the time to examine the individual stones. There is a limited range of symbolic compositions. For women it was common to show Sabbath candles and a hand giving charity (tzedakah). For men, there was an open bookcase indicating scholarship and piety. There are also more unusual designs, such as a dove beneath a crown. I assume, after all these years, that these epitaphs have been transcribed and translated. I will try to find out for sure. If not, my photos are clear enough to allow volunteers to do this work now. (ISJM) The Synagogue of Kazimierz Dolny was built in the second half of the 18th century. The stone building is 14.8 m x 16.9 m and occupies a central position in the town, between the Rynek and the Maly Rynek. The main prayer hall on the south side of the building is about square in plan and is surmounted by an eight-segment wooden vaulted ceiling. A separate women's section occupies the northern third of the site, but because of the sloping terrain, it is reached from a higher spot on the outside, and is only half as high as main hall. Kazimierz Dolny had a substantial Jewish population from the the Middle Ages on. Before the Second World War about 50% of the town's populations was Jewish. Most were killed by the Germans in March 1942. Before the war the town had been a popular resort for Jews, including Jewish artists who loved to paint there (the local museum recently has an exhibition devoted to these painters and their work). Yiddish Filmmakers worked in Kazimierz Dolny, too. It was the setting for the well known Jidl mitn fidl (Yidl with a fiddle) with Molly Picon. to the writer Sholom Ashe is attributed the saying, "In Kazimierz, the Vistula [River] speaks to me in Yiddish." The synagogue building was partly destroyed in 1944, and then rebuilt in 1953 and subsequently used as a cinema. That was the situation when I first visited the town in 1990. Now, the building has been restituted to the Jewish community of Warsaw, which has restored the building (as much as possible) and created an exhibition space and meeting hall. These pictures were taken in Oct 2008 during the First Congress of Jewish Art in Poland which used the synagogue as one of two main conference venues. The synagogue as "restored," looks little like it did in the pre-War years. Surviving descriptions and photos show an interior filled with art - painted ceiling and walls, hanging lamps and, of course, a bimah and Ark. At the time of the recent Congress a photo exhibition of Jewish Kazimeirz Dolny was mounted in the space and one see well the difference between past and present. "Horses, deer, castles, flowers, geese, scales, doves and symbolism in all its richness hovers over the crowd deep in prayer...the elevation with a wooden balustrade, brass candelabra with numerous arms, an embroidered silk curtain, enormous books on pulpits and several splendid silver-bearded types. This is the east - hot and fanatical. The east, in their long flowing garments and silver adornments on their foreheads. These nostalgic passionate songs full of simplicity and woe, these signs for the land once lost, for Mount Zion and the Tomb of David, for the waters of Jordan and the cedars of Lebanon..."
There were many local legends associated with this synagogue. According to Dylewski; " It was said to have been founded by King Casimir the Great as a gift for Esther [his Jewish lover]. The stones in the wall were alleged to have come from the Wailing Wall in Jerusalem." The transformation of the Kazimierz synagogue is an interesting case of new life for old Jewish buildings. Some former synagogue are being restored under the auspices of the Foundation for the Protection of Jewish Heritage in Poland. Other properties, however, are under the direct control of any of the nine distinct Jewish communities in modern Poland. How these communities use their historic properties varies greatly. In Kazimierz Dolny, because of the continued popularity of the town as a major Polish vacation spot, it is likely that the synagogue will be able to successfully perform a cultural role in the town while maintaining some aspect of Jewish identity. For now, there is a Jewish book and gift shop at the synagogue, but no permanent exhibition or other purpose. 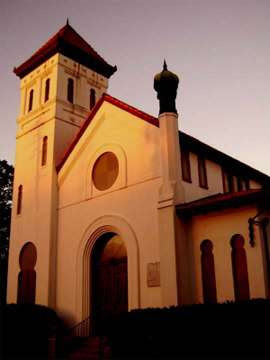 (ISJM) Recognizing the historic value of their 1890 synagogue, members of Temple Beth Tefiloh in Brunswick, Georgia are beginning the process to have the building listed on the National Register of Historic Places. Designed by Jewish architect Alfred Eichberg, who designed the Old City Hall of Brunswick at the same he designed the synagogue, the building retains its original interior woodwork, stained glass and its exterior architectural details, which include the recurring motif of "Moorish" horseshoe arches. According to the congregation: In 1886, David Glauber, a proponent of Jewish life, relocated to Glynn County and convened twenty-one Jewish men to form a congregation and build a house of worship. In 1888, a lot on Egmont Street was purchased and a building committee established. The temple, dedicated on November 7, 1890, was attended by Rabbi Isaac Mayer Wise, the founder of Reform Judaism in America. The synagogue has been in continuous use ever since. Wise came from Cincinnati to deliver the keynote address at the dedication [this history need to be confirmed for NR designation]. The congregation is small (under 50 families) but active. Through the International Survey of Jewish Monuments they will welcome any help from volunteers in documenting and research the history and architecture of their building. (ISJM) The Foundation for the Preservation of Jewish Heritage announced on December 19th that it had finished clearing the Jewish cemetery in Jozefow (lubelskie province) and overgrowth of shrubs and grass. During the cleaning of the site previously unknown matzevot were uncovered. The project was co-financed by the Ministry of Culture and National Heritage within the framework of the 'Cultural Heritage' operational program, priority 6 'Protection of Historical Cemeteries'. Henryk Halkowski, the heart and soul of Jewish Krakow, died suddenly of a heart attack in Krakow the night January 1-2. Henryk was full of history, opinions and stories. Among his projects at the time of his death is a volume of translation and commentary of Rabbi Nachman's Stories. I first met Henry in 1991 or 1992, when I was just beginning the Tempel Synagogue restoration project for the World Monuments Fund, and he introduced me to Jewish Krakow. I last saw him only two months ago. It had been many years since our last visit, but we picked up immediately...almost in mid-sentence from before. Many people will remember Henryk for a long time to come, and they will hear his voice and his laugh, even when he is gone, as if he is picking up the conversation in mid-sentence. My sister Ruth know Henryk very well, and she will be writing something about him soon.